Since the travel season is already upon us, and school is on summer break, we expect many to be making various plans for their travels. Itineraries will be set to their preferred destinations for both local and foreign trips. There's going to be another huge demand for transportation services, hotel and resort accommodations, souvenirs, theme park and tourist spot visits, tour guide requests, and a lot more that would boost our country's tourism effort to the max. It is such a great thing that many travel expositions, trade shows and fairs are being organized to gather many travel and tour providers for the convenience of consumers, both local and foreign tourists. Among them is the NAITAS Travel & Trade Show for 2017 which offered up to 80% discount on outbound and inbound travels as well as on tourism allied products and services when we make bookings and purchases onsite. 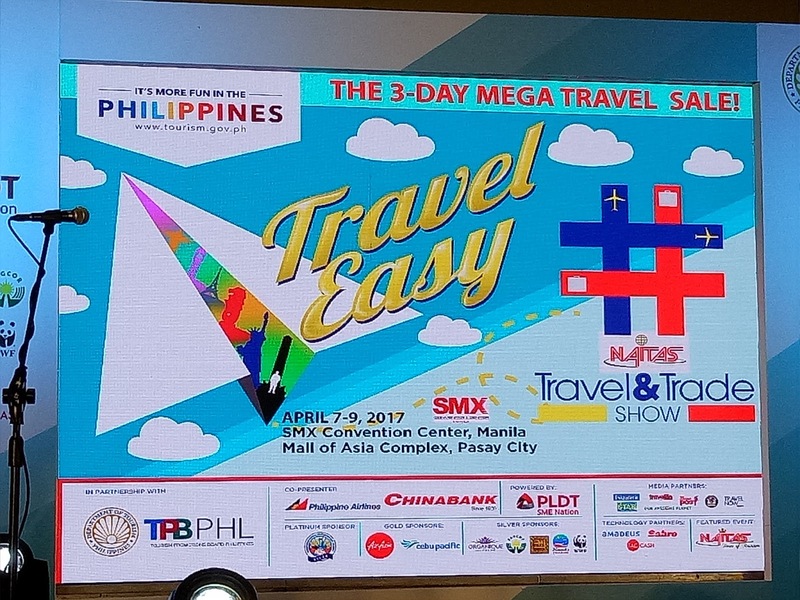 The event is organized by the National Association of Independent Travel Agencies, Inc. (NAITAS), one of the country's biggest travel and tourism association, in partnership with the Department of Tourism and Tourism Promotions Board Philippines. Meanwhile, the “B2B Travel Networking” feature of NTTS 2017 provided a venue to local and international tour operators and travel agencies to nurture business relations or initiate profitable deals. All these happened on April 7 to 9 at the SM Mall of Asia SMX Convention Center. No less than the Department of Tourism (DOT) Secretary Wanda Tulfo-Teo and Tourism Promotions Board (TPB)Chief Operating Officer (COO) Cesar Montano, plus other notable personalities like Organique Acai Ambassadress Cory Quirino, and the officials of NAITAS and DOT graced the event for the ribbon cutting and opening program held at the stage area of the event. The 3-day Travel Mega Sale (scheduled from April 7 to 9) started a day after the first day of Madrid Fusion Manila 2017 which was happening at the rest of the functions rooms of the SMX Convention Center at the SM Mall of Asia complex in Pasay city. There was also a Korea Philippines Trade Fair happening at another hall. This meant several possible clients for the NAITAS Travel & Trade Show coming from different countries who are attending the other events. To know more, NTTS can be reached at ntts.eventmanager@gmail.com, (63)977.6394830 (Globe), (63)949.4181479 (Sun) or 0922 8906612 www.naitas.com.ph.